Housed in the first floor room of the central tower built by Julia, begin your visit in the Tower Gallery. Walk along a timeline illustrating Julia’s life and times and see images of, and created by, some of the ‘Teachers and High Priests’ who inspired her photography. 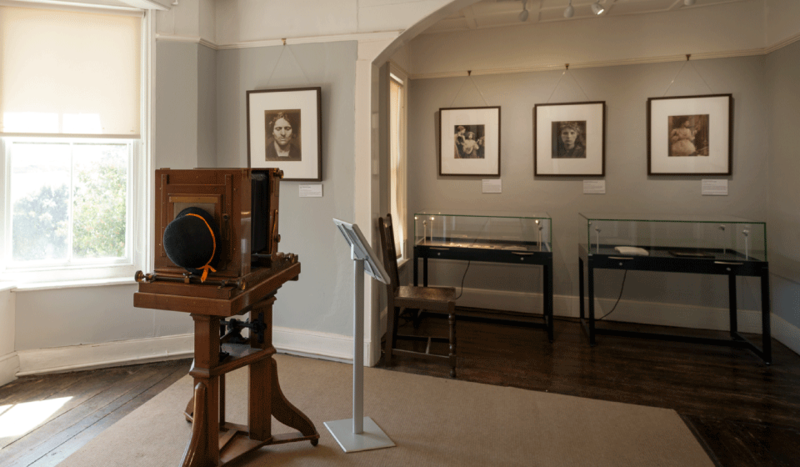 Continue into the Cameron and Ellen Terry Galleries where you’ll find a range of Julia’s celebrated photographs and other displays, such as a large dry plate camera which is over 100 years old. You’ll also find a display about how Dimbola was saved and the establishment of the Julia Margaret Cameron Trust. Come into our Victorian dressing up room where young and old can have lots of fun with friends and family trying out our range of costumes. Cross back over to the other side of the house and you’ll find the Olympus and Charles H. Cameron Galleries where our diverse programme of changing exhibitions are shown. In these rooms you’ll find exhibitions of contemporary and historic photography from both world-renowned and up-and-coming photographers. We also host exhibitions by artists who respond to or have been inspired by Julia and her legacy. Exhibitors in recent years have included Annie Leibovitz and Chris Packham. Please see Changing Exhibitions for up to date information. An exhibition on the third and final of the original Isle of Wight Festivals held at Afton in 1970 within sight and sound of Dimbola. Included are rare original posters and evocative photographs. There is a panoramic photograph of Afton Down which gives some idea of the vast audience of 600,000 gathered to watch Jimi Hendrix, The Doors, Joni Mitchell, The Who, Leonard Cohen and many others. To complement this there is a display of posters and images of the new IOW Festivals, revived by the leading music agency Solo in 2002, which have featured such artists as The Rolling Stones, David Bowie, REM and Paul McCartney. We have recreated Julia’s bedroom using period furnishings and decoration. It contains displays about her photographic techniques along with an audio commentary.